What can be said about the Warhammer franchise video game offerings, both fantasy and 40k, that hasn’t been said before? Over the past few decades there has been more than a healthy amount of releases spanning multiple genres. Primarily the focus has been on strategy but we have also witnessed a generous offering of shooters, action adventures and so forth. 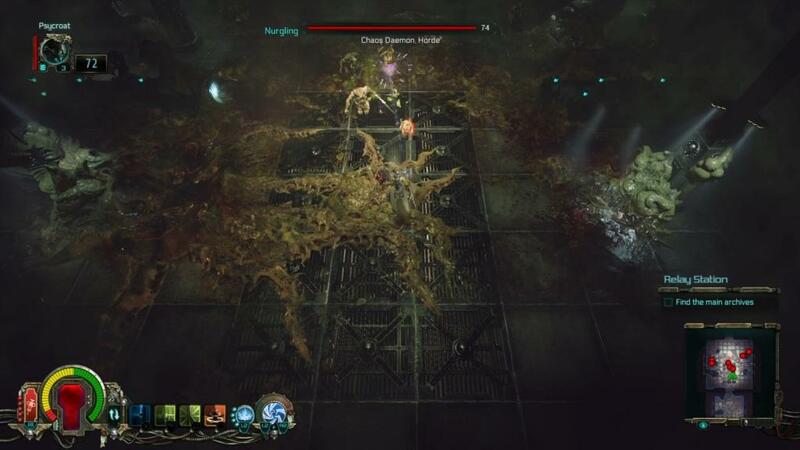 The release of Warhammer 40K: Inquisitor Martyr by NeocoreGames signifies the first attempt to dive into the ARPG space and answers the question on if the wait was worth it. Initially you will be met with a character creation screen where you will be introduced to the three classes, the Crusader, Assassin and Psyker followed by their own set of three subclasses. Subclasses are virtually pointless as they will only provide you with your initial load out. 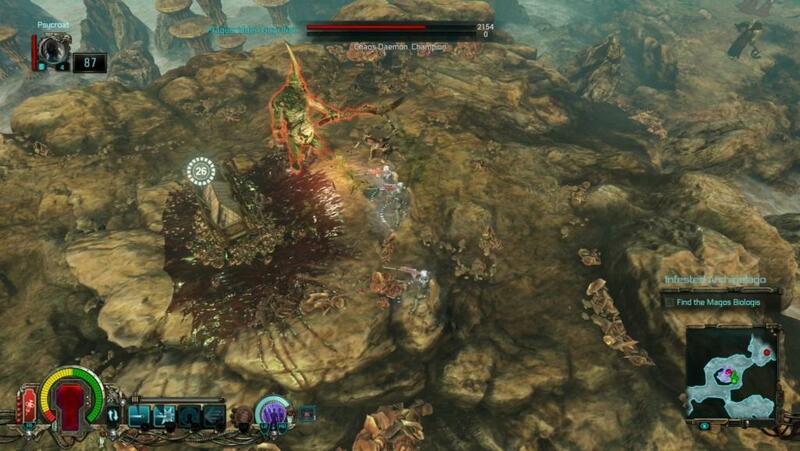 The classes however are vital in molding an ARPG experience. The Crusader will be the simplest and most familiar feeling class. Able to wear the bulkiest armor, these walking tanks excel at entering direct combat with the enemy to see who can hack away the longest before falling. The Assassin, as the name implies will need to employ more cunning to get the upper hand. They are a good mix of elements from both spectrums of the combat table and possess the only true dodge in the game, which will come in handy on more than a few occasions. Finally, the Psyker is what most would be tempted to call a mage but with a very unique mechanic of needing to balance their damage output. Using abilities can be penalized by debuffs or warping in enemy spawns. Picking my class and heading into the game proper, I was met with the first cinematic and I was honestly worried. What unfolded before me seemed pretty blurry, like it was a lower resolution image stretched over my high definition display. Luckily, those fears were removed once I gained control of my avatar. The initial tutorials took place in a dark and gritty space citadel. It was appropriately atmospheric possessing sterile mechanical environmental designs, abundant smatterings of blood and gore and grotesquely detailed enemy designs that were fitting of not only the license but my current generation gaming device. I continued to be satisfied with the graphical department during my adventures as new planets visited showed a variety of both synthetic and organic settings. Weapons and armors possessed many different texture and colour variations and all enemy animations, both big and small, were worthy of their screen time. I know the tendency when looking at games like this is to compare them to Diablo but don’t, as they are similar in genre only. This is an altogether slower experience but not in a bad way, it is by design so that the focus can remain on more strategic elements such as the cover system which can be utilized by both the player and enemies. If you are expecting levels where you just breeze through while copious amounts of loot drop and your damage numbers pop in unreadable amounts, you will be disappointed. You should instead save what disappointment you have for the bugs that you will encounter. They were definitely the biggest concern I had. While there were only a few situations where I suffered from hard crashes out of the game and a few where my character would struggle to move, be it because they were running against an invisible wall or an item that was graphically demolished from their touted destructible environments still keeping their hit box, the bigger issue were the dropped controls. Far too many times I would be in the heat of battle and my character would just stop responding to controller inputs for attacks. Pausing and resuming the game would often remedy the issue but it was usually after taking some unnecessary damage that I would realize what was taking place. Back to the loot which drops infrequently with an additional crate of gear rewarded at the completion of each mission. It becomes very important since your abilities are directly tied to your gear. Different weapons will change your attacks and your armor will dictate your bigger cool down skill. Part of the strategy previously mentioned comes with planning out your gear load out before venturing out on a quest as there is no menu mid-level. That’s right, you can only access your inventory while in the hub or on the mission map. This means that if you don’t like the proximity mine you brought, you will have to adapt and make do until you are done that run. While this was jarring at first, it was mostly because of my expectations and after awhile I grew to like it. When playing other ARPGs I would find myself in a menu every time I saw one of the many loot drops hit the ground because I was hunting for even the smallest upgrade. In the long run I would be spending more time in menus than I needed to because often I would only be met with the realization that the drop was not what I was hoping for. Only being able to tinker between missions would keep the focus on the adventure at hand and in the long run would mean less time in the menus as a whole since I would get in, check all the details from the last run at once and then move on. The statement that there is no menu mid-level doesn’t just extend to the inventory. Gain a level and you aren’t using that skill point on one of the many trait trees that help customize your character either. Complete an in game achievement that unlocks one of the many passive abilities and you guessed it, no dice until the game allows it. None of this will be overly noticeable since like details on the loot you obtained, you won’t see experience gains, level ups or ability unlocks until the mission summary screen. On paper it doesn’t sound like what we are used to but in practice it is hardly a noticeable issue. The other big misstep that many will make reference to is that there is no co-operative play during the campaign missions. Again, an element that seems bad on paper but venturing off solo seems to fit the overall feel of the universe and allows the game play to be tuned to the strategic depth the developers were aiming for. The story can take around 25 hours to complete and its delivery is rather enjoyable, particular acknowledgement to the voice acting of the assassin which is fantastic. That being said, it is far from all this game offers. Bringing your character to max level could easily double that play time and the many replayable activities which can be done with a friend will keep you logging in thereafter. You will not find yourself running out of features to play with and things to do. Investigations will provide you with new timed experiences, patched updates eventually leading to seasonal content are planned, customizing randomized missions will provide countless fresh experiences, and the full release will also provide a pvp experience that I was not able to test in the review version. Crafting, countless appearance options and an extensive endgame loot grind amongst other things mean that if you like what you have here, you will have more than enough to keep coming back to. 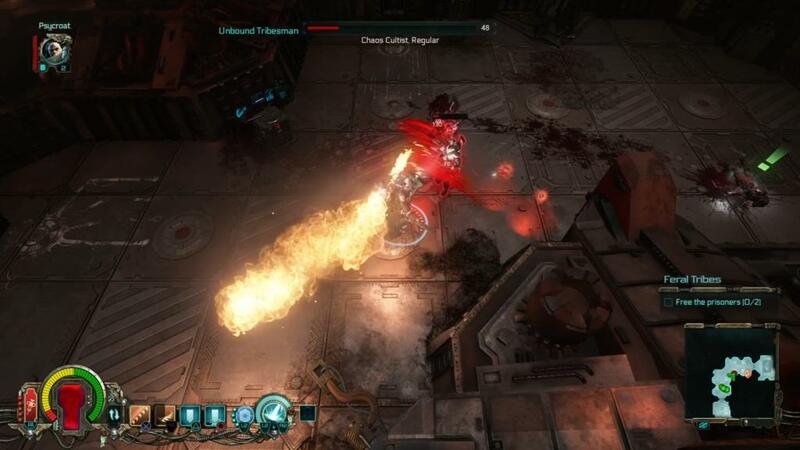 Overall, Warhammer 40k: Inquisitor Martyr is a good offering that will be appreciated for treating the license with respect and doing it justice. Obviously, established fans of the lore will appreciate and enjoy the game more but there is a lot to be valued here as a video game in and of itself. The only real issue is that no matter what walk of fandom a gamer comes from they will end up knocking a point or two off for the bugs and lack of polish. Still all of that can be cleaned up with patching and should not deter anyone away from a purchase.